Artist's illustration of the Lunar Reconnaissance Orbiter's CRaTER instrument, center-mounted at the bottom of the spacecraft. Cosmic rays from beyond our solar system constantly pummel Earth's moon, fundamentally changing the chemistry and color of the lunar ice and dirt, scientists say. 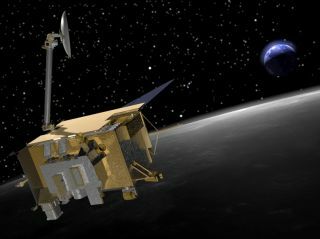 Now, new measurements of the strength of this space radiation from NASA's Lunar Reconnaissance Orbiter show that these cosmic rays can cause significant chemical alteration on the surface of the moon. For example, when the particles hit ice, they can cause frozen water molecules to release oxygen, which is then free to bind with carbon to form prebiotic organic molecules. The measurements also help scientists test theoretical models of the moon's radiation environment. This could prove important as cosmic rays are thought to present a significant radiation risk to astronauts during space travels. If people were to undertake a months-long trip to Mars, for example, finding ways to shield the spaceflyers will be necessary. "Our validated models will be able to answer the question of how hazardous the space environment is and could be during these high-energy radiation events, and the ability to do this is absolutely necessary for any manned space exploration beyond low-Earth orbit," University of New Hampshire physicist Nathan Schwadron said in a statement. Cosmic rays are predominantly protons, electrons, and charged nuclei of basic elements. They flow into our solar system from elsewhere in the galaxy, and their paths are bent by the magnetic fields of the sun and Earth. While our planet's atmosphere protects us from the brunt of cosmic rays, the moon, which has no atmosphere, is exposed to their full force. The new findings are especially useful because the Lunar Reconnaissance Orbiter's CRaTER instrument, which the researchers used in the new study, measures how much radiation pierces a layer of plastic designed to simulate human tissue, thus revealing how much radiation would likely pass through astronauts' bodies. Furthermore, the measurements were made during a period of especially heavy cosmic ray radiation, because the sun happened to be experiencing a lull in activity, which otherwise would have damped down on cosmic rays. "This has provided us with a unique opportunity because we’ve never made these types of measurements before over an extended period of time, which means we’ve never been able to validate our models," Schwadron said. "Now we can put this whole modeling field on more solid footing and project GCR dose rates from the present period back through time when different interplanetary conditions prevailed." The research is detailed in a recent online edition of the American Geophysical Union's Journal of Geophysical Research.